It’s been a long time since I visited the Outer Banks. It was at least one used-car back! But I had not been to Cape Fear so this was partially a new visit and partially a revisit. Cape Fear is below Wilmington, N.C., but just above the South Carolina / North Carolina line. 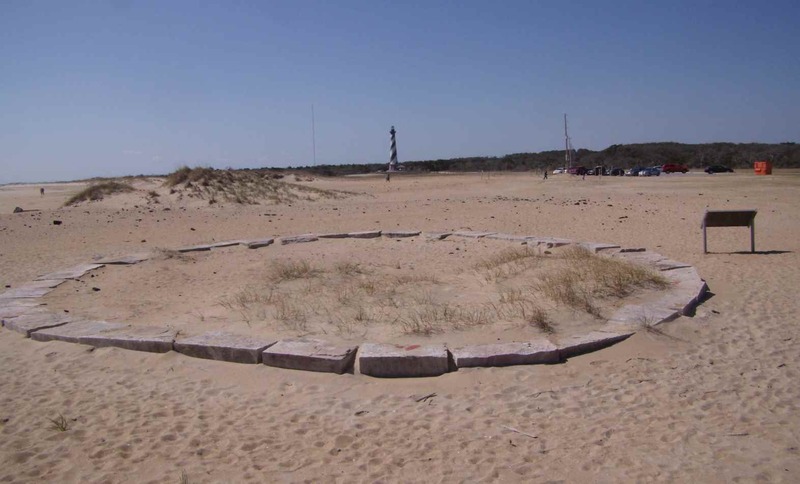 The cape itself is made up of a spit land between the mouth of the Cape Fear river and the ocean. (Many might recognize the name from the two movies titled “Cape Fear” both based on the book by John D. MacDonald.) West of the cape and north is pretty much the same swamp that you would encounter in that part of the Carolinas. The US 17 coming up from Myrtle Beach circles west around the river into Wilmington but you can ferry across the mouth of the cape to Fort Fisher below Wilmington. It is cheap. Five bucks. Do it. At Fort Fisher is access to lots of birding, fishing, and hiking. Also, if you like aquaria there is the N.C. Aquarium at Fort Fisher. Above Fort Fisher is pretty much developed. Lots of beach houses, franchise eateries, crab shacks. Wilmington has extended itself southerly (as well as all other directions, of course). 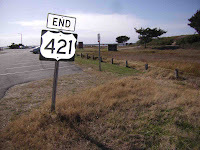 As you can see in one of the photos this is also the end of US421 which has wound its way down to here from upper east Tennessee. Wilmington is just like any medium sized city. Traffic. Junk food. Road work. Enough said. But, if you can spend the time, Fort Fisher and the cape are worth it. Plan on wind, sun, and lots of walking. 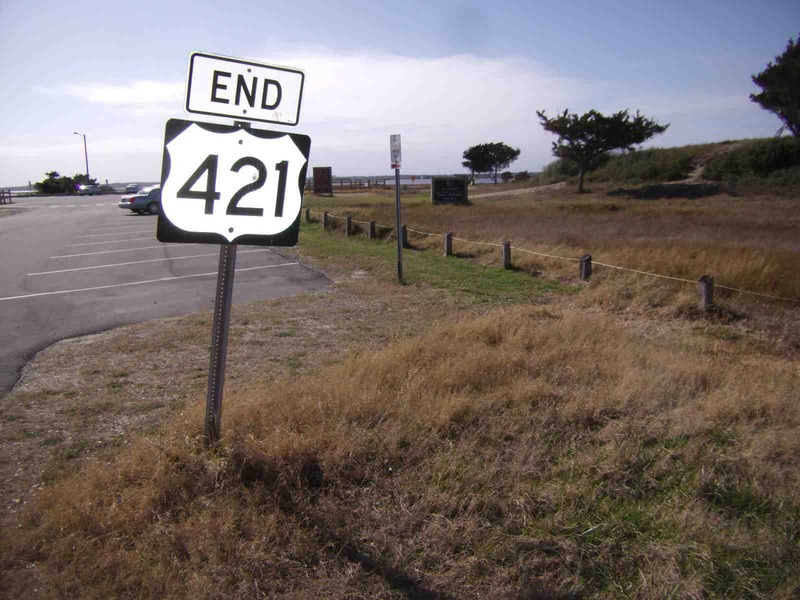 There are two routes to the Outer Banks from Wilmington. I took the longer, less interesting. US 17 which you can pick up at Charleston continues here as a nice highway without a lot of stops going due north. You have to skirt Pamlico Sound and there are no short cuts on this route. On the map you veer very far west from the Outer Banks. I can’t stress that this might very well be your only route if the ferry from Cedar Island is not an option. These are effectively your only choices. But, I made the drive up US 17 and then straight east on US 64 into Nags Head on the Outer Banks in what seemed like more than enough time to spare. Plus it was nice drive. The roads are good. Fast. Flat. Not a bad option but not my first option. I wanted to take the ferry. On this day, however, two things were operating me. i didn’t have any way of knowing how far or how long it would take to go to from Wilmington up the coast road to Cedar Island. Cedar Island is the last mainland below the banks. The ferry ran at 10:00 and at 4:30. Plan ahead on this option. Get a place to stay near the ferry and make sure you get a reservation for the ferry, too. The other thing that was against me this day was the weather. It turned really nasty and I’m susceptible to seasickness. Just one of those things to think about. We don’t have many ferry boats in our part of the world, but, believe or not, up until 10 years ago, the State of Tennessee operated a ferry across the Tennessee river from I-65 to Dayton, Tenn. They built a bridge finally, but the ride was a lot of fun. At the Outer Banks, where US 64 ends, you go either north towards Nags Head and all the resort-y stuff there like T-shirts, kites, hammocks, food (! ), and hotels or, you turn south and plan on driving for a long time. You have to like sun, surf, and sand ‘cause that’s all there is. Which is why you’re here to begin with. 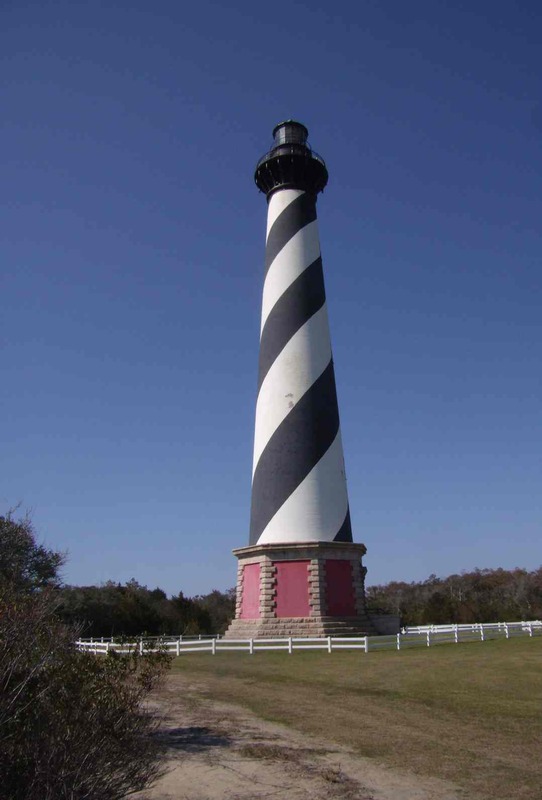 South is to Cape Hatteras lighthouse (white with black spiral) and beyond it is Ocracoke Island. The trip to Hatteras is the good stuff. Along the way, Bodie Island Lighthouse (white with black bands) has a large lake with walkway. You can pull out numerous places and walk. On the sound side, the water is quieter, of course. But on a good day (like what we had last fall at Huntington Beach S.C.) the bird watching on the ocean side is fantastic. Bring your Peterson’s Eastern guide or, better yet, buy one of the laminated, pocket-sized localized bird guides for sale at the parks bookstores. I picked up: pied-billed grebe, merganser, harrier, osprey, sanderling, pelican, cormorant, great egret, snowy egret, herring gull, both grackles, laughing gull, ring-billed gull, and TV (by the dozens). p.s. Be aware, the North Carolina State Police patrol in unadorned, grey Challengers. They are hard to spot.